I’m a collector. I’ll admit, sometimes I’m not terribly practical but instead find myself at an antique market, leisurely strolling about looking for things that strike my fancy. It is this aspect of my personality that led me this week, to styling a sideboard with decorative boxes. It’s not that I set out to look for boxes and it’s not like I didn’t have any to begin with. But this was one of those rare occasions when I had time to shop and nothing in particular that I needed to find. It was that uniquely blissful circumstance when you arrive at the market and just meander. I can’t tell you how many times I’ve been to the very same market, and others like it, with a specific aim in mind and no extra funds to let serendipity take its course. But this week was different and I delighted in the aimless wandering. To be honest it didn’t take long. The local market I frequent is quite large with many vendors on two floors and room after room filled with various treasures. I was barely in the door when I happened upon my first score. Certainly I was influenced by the fact that I had Valentine’s Day on my mind, but there in a dusty corner was an adorable cupid. I started my pile. Shortly after the cupid is when I became entranced with the boxes. Initially I was thinking of filling them with Valentine’s Day candy, but when I brought them home and started to style a vignette, the tops of the boxes were way to lovely to cover by keeping them open to display sweets. 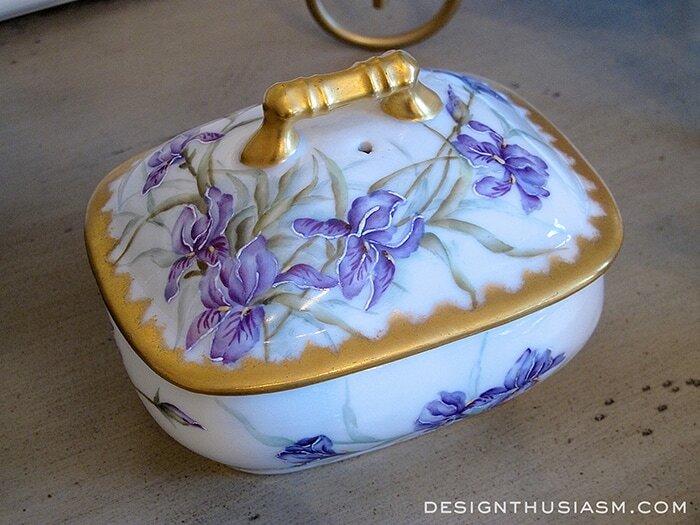 My decorative box collection was actually started long ago with this delightful piece found in Megeve, France. I have another like it I keep by the entryway to hold our keys when we come in the door. 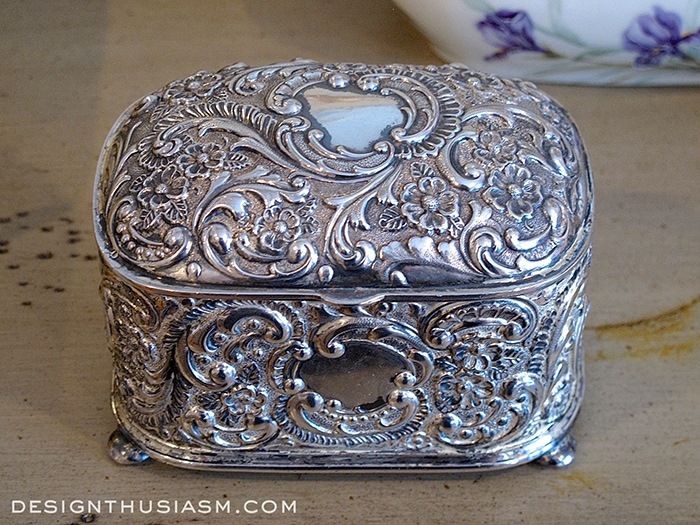 The first of the new pieces was this sweet little jewelry casket. It’s quite tiny but with wonderful detail. When I first found it, I wasn’t planning on gathering a collection. I just liked the box and added it to my pile. 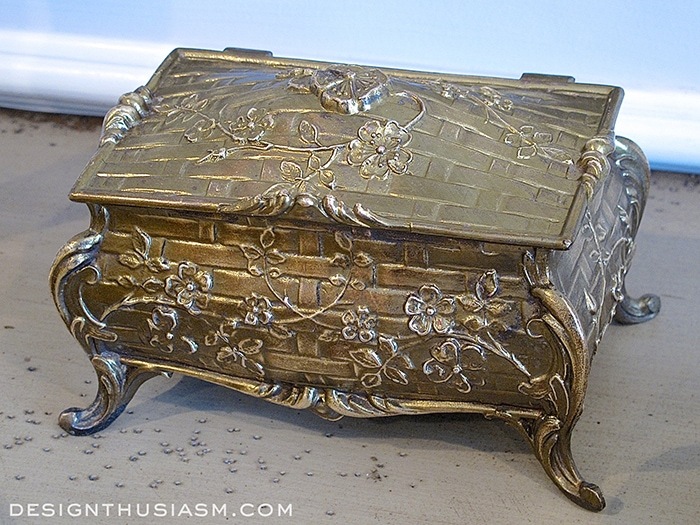 Next I found this brass box, with pretty little flowers and feminine legs. My first thought was ‘I already found a box I like. I should look for something else.’ But the scale was different than the first and the metal color too. So up it went to my growing pile at the register. By the time I came to this piece, I was beginning to think about displaying them together in a vignette. Two pieces are not a collection, but once you have three, you have the beginnings of a statement. I loved that all three were different in material, and even in the store I was thinking of a merchandised grouping. 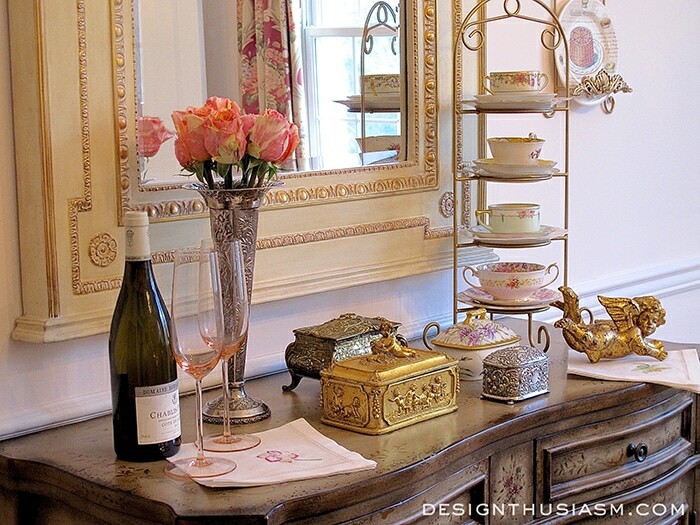 Once I got my wares home, it was time for the real fun… styling the sideboard to complement a romantic meal. 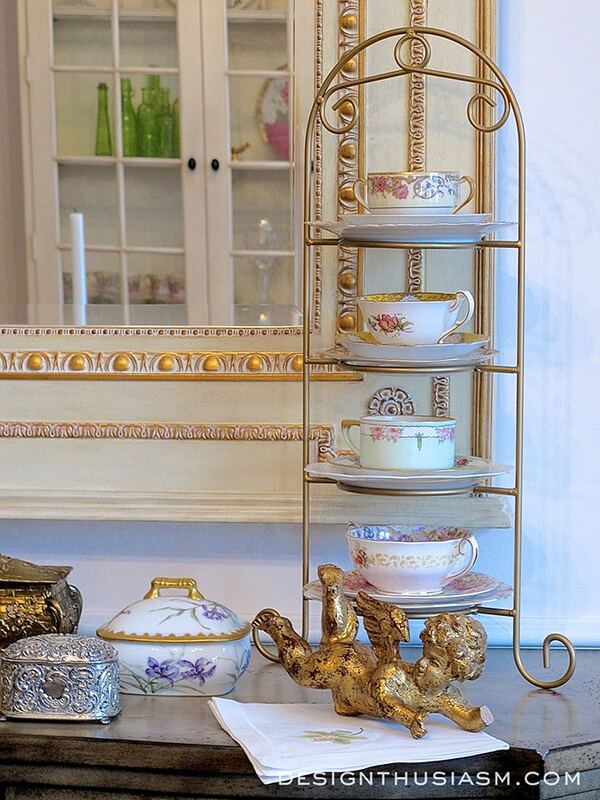 Out came my favorite china pieces and a pair of pink champagne flutes. I’m not going to lie… the silver flower vase is new too! 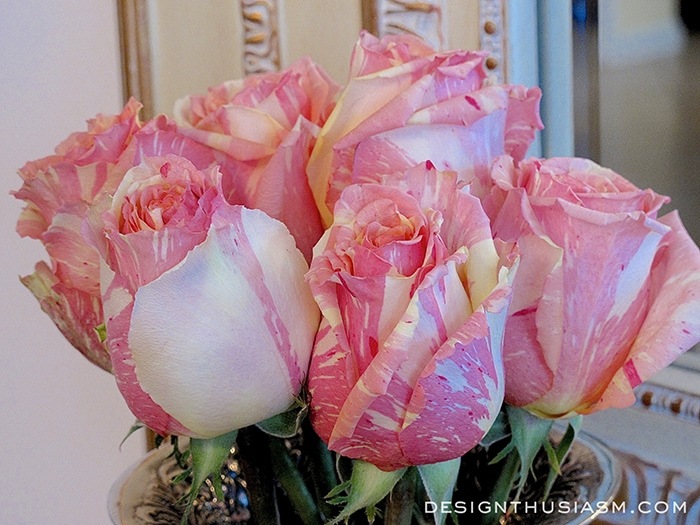 For my romantic setting I bought these gorgeous roses. The embroidered white napkins are from Fragonard in Paris. 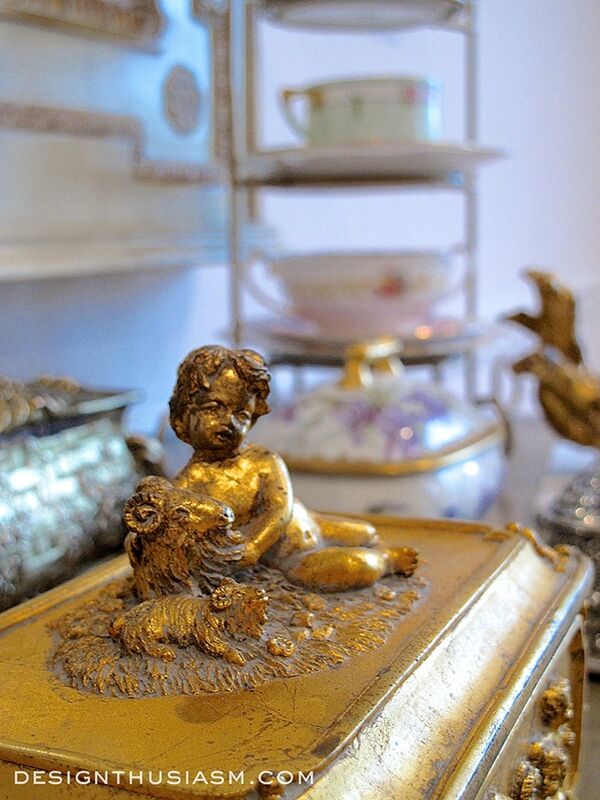 I love the way my new cherub works with the figures on my gilded French box. 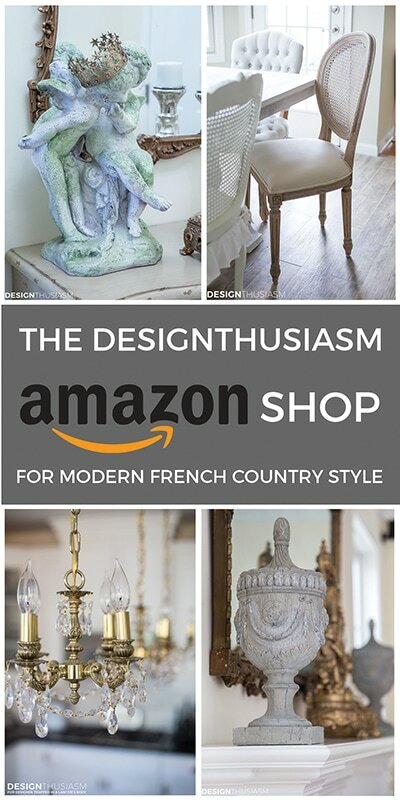 I will be highlighting some of my other collections from time to time, and illustrating how I use them in my decor. 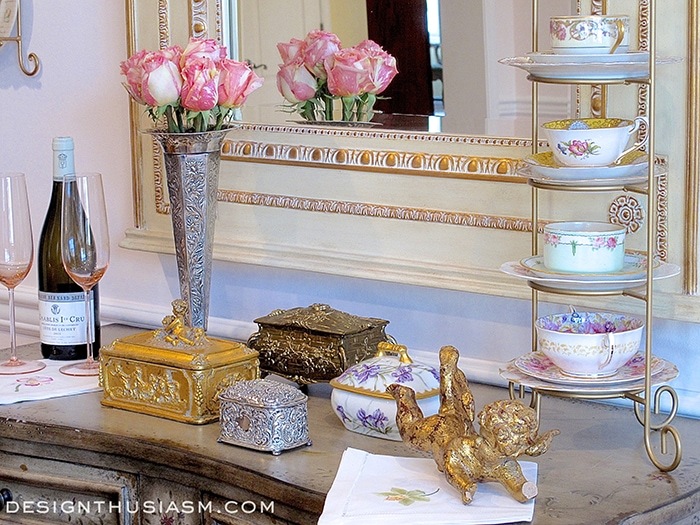 Here you can see some that I’ve already posted: Using Teacups in the Home, Collecting Silver Accessories, and Decorating with Mirrors. Enjoy your next trip to the antique market! Linking with Heart and Home Monday, Dwellings Monday, BNOTP Monday, Cozy Little House Tuesday, A Stroll Thru Life Tuesday, The Scoop, A to Z Monday, Savvy Southern Style Wed, Dream Create Inspire, Jann Olson Thursday, From My Front Porch to Yours, 21 Rosemary Lane Thursday, DIY Like a Boss, BNOTP Thurs, Charm of Home Thurs, Feathered Nest Friday, Craftberry Bush Thurs, Romantic Home Friday, Best of the Weekend, Interior Frugalista DIY Showcase Sunday, Thoughts from Alice Sunday, Table It. 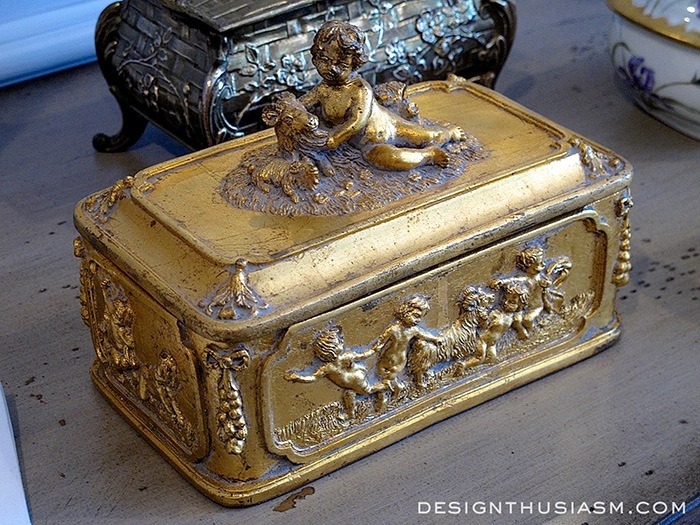 I love your little boxes and the cherub is so sweet especially for Valentine’s Day. 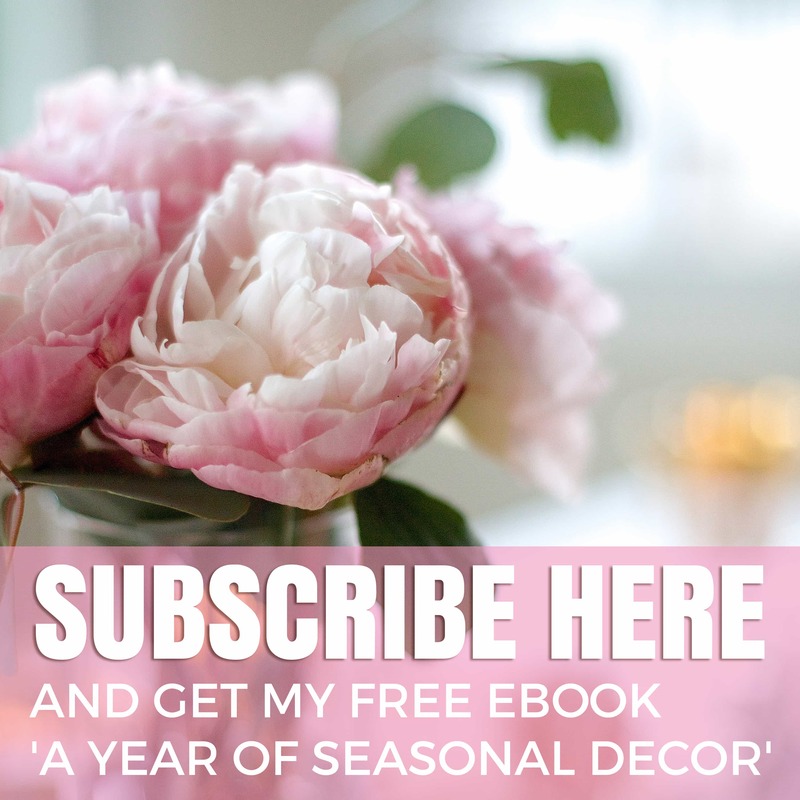 I do know the feeling of creating something new for a special spot in your home. About 15 years ago I was decorating a mantel for the first time. Never had a fireplace before that. It was so much fun looking for things to put onto the mantel. Enjoy your new sweet decorative boxes ~ they are beautiful. Thank you, Rose! It’s such a pleasure when readers share their passions that coincide with mine. Keep styling those vignettes. I know for me I get such joy as I walk past them. It’s always funny how one new purchase can breathe new life into something you’ve owned for years! Thanks for visiting!! I am beyond thrilled that I found you! Your style speaks to my heart and I am taking notes of my favorite things to incorporate in to our newly finished guest house and entertaining casita! Your tablescapes and vignettes are some of my favorites and now my creative juices are flowing with endless possibilities! Wow Valerie, nothing makes me happier than receiving a comment like that… 🙂 Thank you so much! I was up ’til 4am working on that post (really!) and it’s so validating knowing that it resonates with people. Thanks for visiting!! Thanks, Maritza! 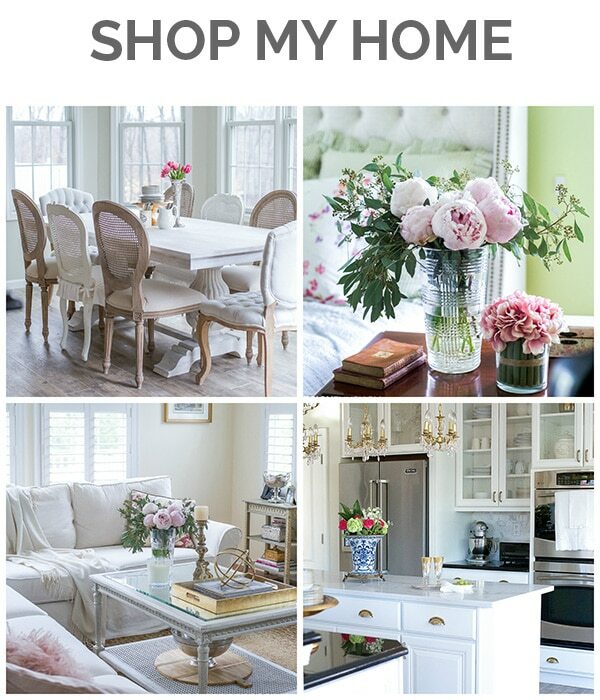 It’s funny, because I actually do love the all white decor I see, but in my own home I tend to add color all the time. It’s always soft and pale, and our sofas are all white, but I do tend to add more color in my rooms than I realize… 🙂 Thanks for the kind words!! 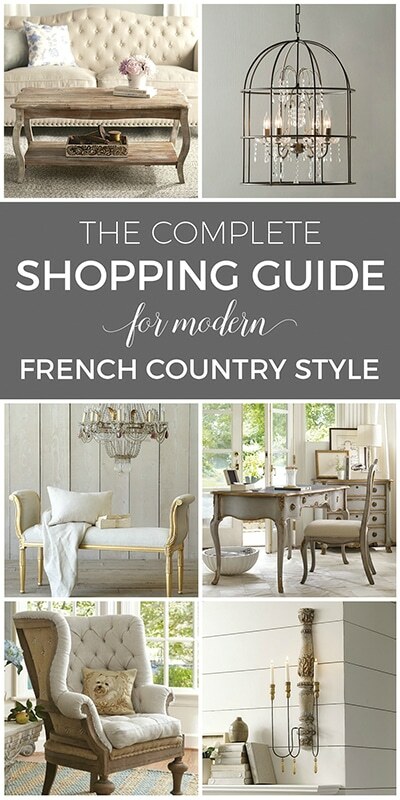 That is a perfect day–time to browse and $ to spend. LOL! I love boxes (wish I had more) and yours are so pretty. I am in love with cupids–there is something so romantic about them. When I do our gold themed Old World Christmas tree, it has many chippy gold cupids throughout. I also love crystal with embossed silver lids, like the ones you have–very elegant! My new granddaughter is due in five days–I can barely contain my excitement! JUST HAD TO GET THAT OUT. I keep thinking the phone will ring at any moment. Thanks for the lovely post. I love your style! 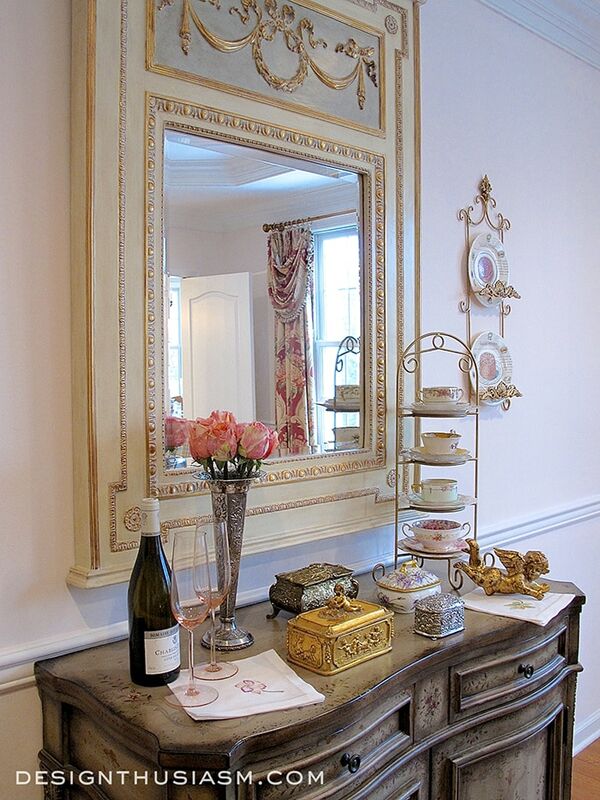 I like the boxes you used to Create this vignette… And your mirror is pretty! Oh and those roses are pretty, I haven’t seen any like that before! 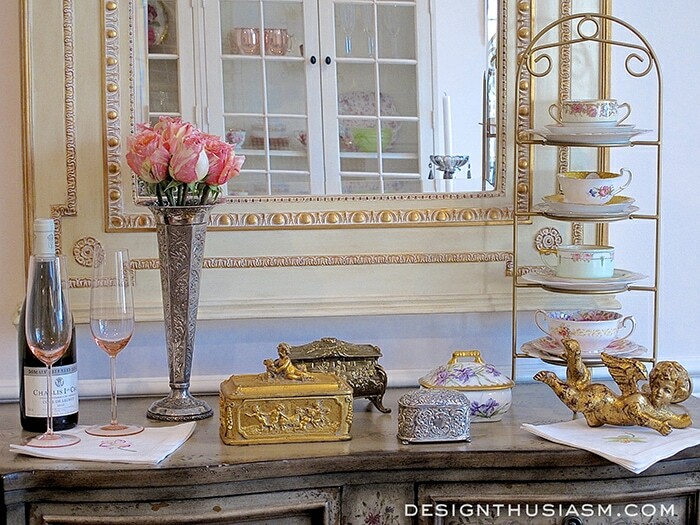 I think perhaps my favorite part is how you used antiques to decorate! So pretty, Lory! 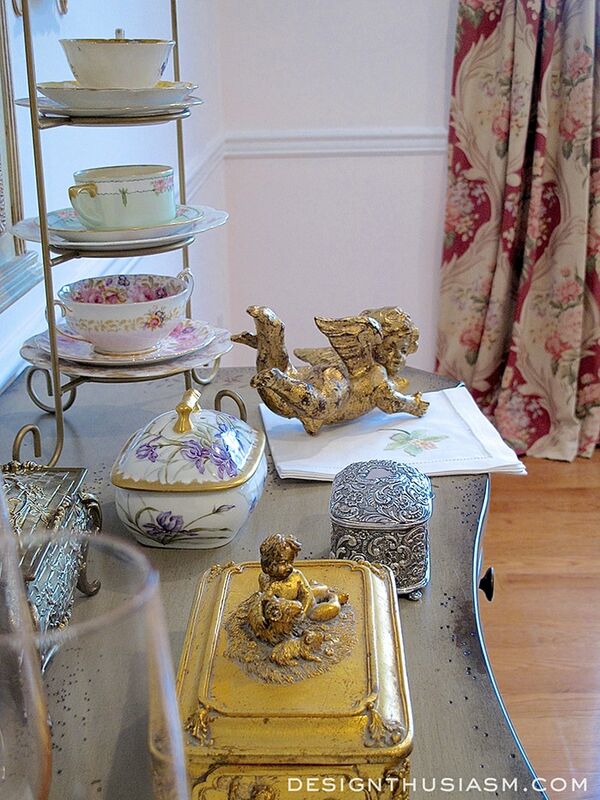 I love all things cherubs/putti, and the trinket box with the putto is wonderful! 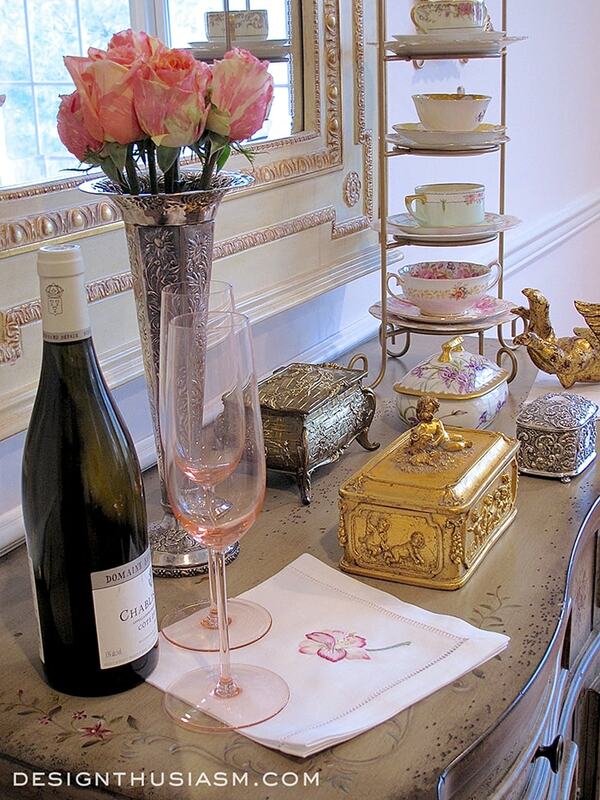 The napkins are too pretty to use, but they look gorgeous with the pale pink of the champagne flutes. Thanks, Rita and so funny that you said that about the napkins. I actually have always felt really strongly about using all of my things, but for some reason I haven’t used those yet. It’s crazy to keep them so pristine, but I love them that way. I bought enough for a full dinner service, but most are still in the package. I really need to get past that… 😉 Thanks for visiting! 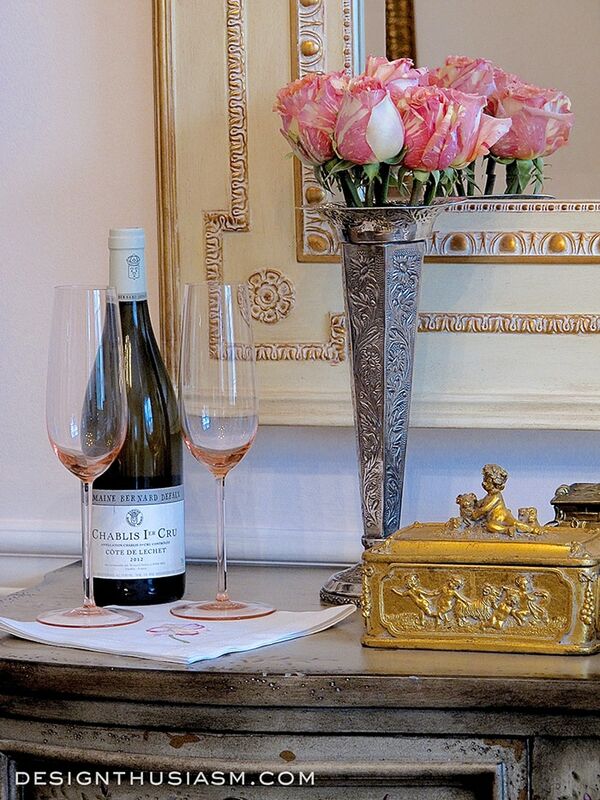 All so pretty and your dining room draperies are stunning….it’s been a long time since I’ve seen any that nice. Thanks, Connie! Yes, I wish the fabric of the draperies was still available, because I’d love to do more with it, but at least I was able to bring them with me when we moved to our new home. Thanks for stopping by!! I love the boxes and the way you’ve displayed them. What a pretty collection! 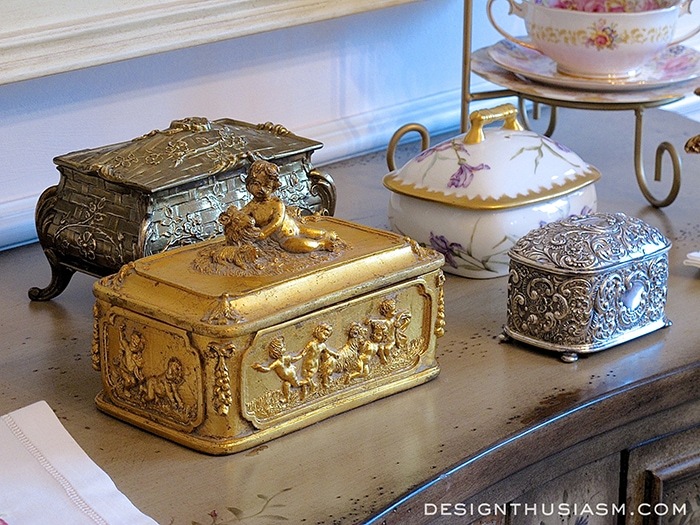 I am always drawn to beautiful antique/vintage decorative boxes of all kinds….wood, glass, metal…they are certainly add so much beauty to any decor. 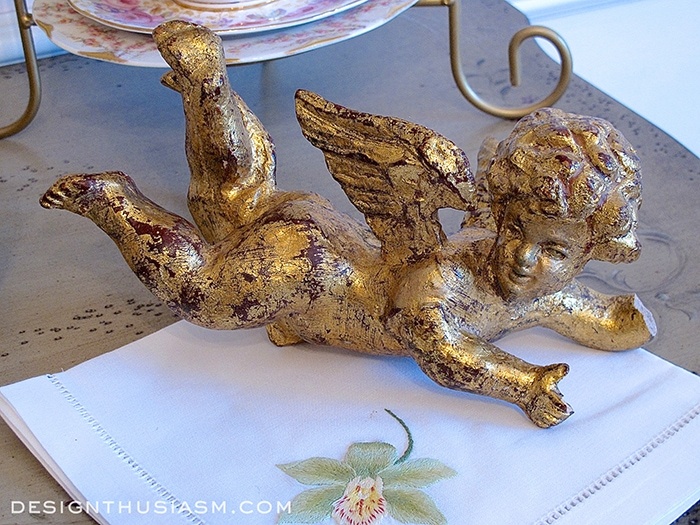 You did score on that gorgeous cherub!….Exquisite display!….and yes, so nice to have a day of browsing the antique shops/malls with nothing specific in mind…just things that make you happy! Thank you, Shirley! Yes, it was a rare opportunity, just between ‘must buy things for Valentine’s Day’ and ‘must start thinking spring’. It was fun to let serendipity take over… 🙂 Thanks for visiting!! Those are so pretty! Perfect to display at Valentine’s Day. Thanks for sharing at Home Sweet Home! 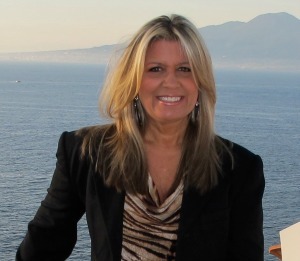 Hi Lory, I just came over from the SYC at Jann Olson’s. Glad to find you! I, too, find boxes irresistible and you’ve done a beautiful job of styling that sideboard!